Designing software based on a checklist of screens can blind designers to the overall customer experience. To understand any individual screen, you must understand the chain of events that led to a user going there… and you can can map this out. The customer flow above shows how a user eventually arrives at a settings screen. Most customers don’t log in thinking “Hmm, I’d love to edit my configuration, update my settings, or manage my preferences“. They’re do this after coming across some behaviour in the product that they want to change. A settings screen is often a hack to make every attribute on the user model updatable in one screen. It’s tricky to make these attributes editable in place throughout a product, but it’s massively valuable as it doesn’t break a user’s flow. If they see behaviour they don’t want, they can fix it there and then, and carry on with their business. This is why it’s important to keep the goal in sight. When you lose sight of the goal, the system you design might be perfectly usable, but ask for far too much tool time from the user. 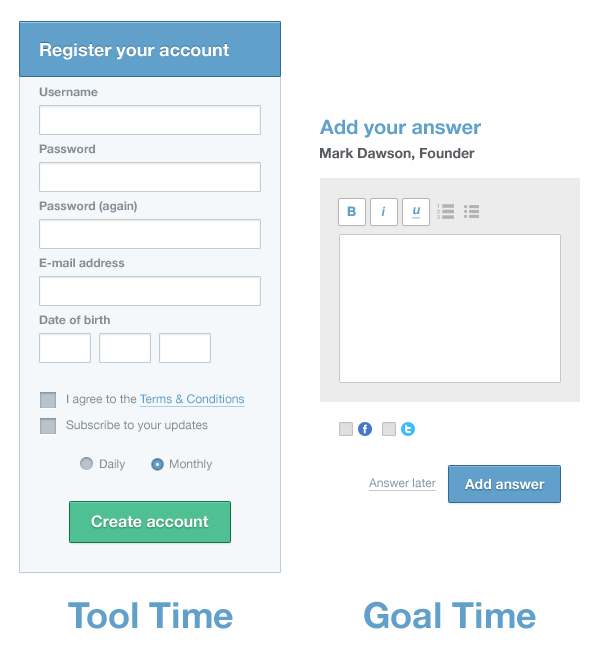 Distinguish the time your users spend with your software into goal time and tool time. Goal time is time spent by the user working directly towards the result they want. In Intercom, goal time is the time our customers spend gaining insight into their userbase, writing auto messages and emails, talking with customers etc. In short, they’re doing the stuff they want to do. Tool time is anything where time spent is on valueless or administrative tasks. Settings, Preferences, Setup– all of that stuff is a sidetrack. Tool time is inherently frustrating. Every time you open the Settings app on an iPhone, you’re wasting time you could spend doing something fun. A set of usable screens that look good can still be a bad experience if no one has considered the flow between them. Each screen makes sense independently, but as a flow it doesn’t reflect what the users goal was. The experience is the sum of all of the time spent in a product. Some of these moments will be good, some will be great, and some will be incredibly frustrating. Frustration comes from an abundance of tool time. It’s the UI equivalent of bureaucracy. “Sorry, you’ll have to fill in this form, then go to this department and fill in their form, then come back to me and we’ll see if we can progress“. Key idea: Assessing a screen helps you identify interface blunders, but only by assessing a full flow from a user’s perspective will you understand the experience. By dividing the time spent into tool time and goal time, you’ll get a real understanding of what a product is like to use.